I love a chocolate bar and one of my favourite chocolate bars used to be good old Cadburys Fruit & Nut. So, here is my take on it - hope you like it! All measurements are fairly rough for this recipe as you can make it to suit your preferences. Add more of anything if you like! 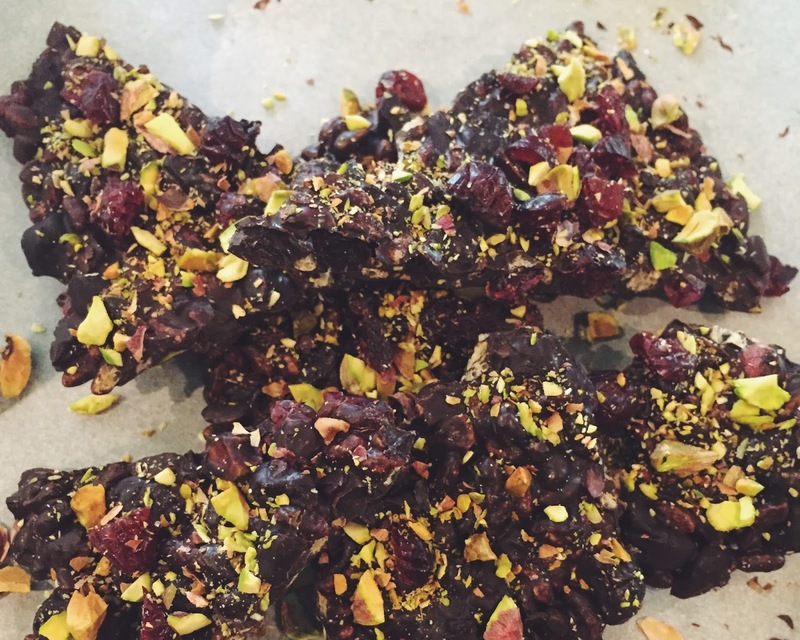 Quite simply melt the chocolate over a ban-marie, mix in some chopped up pistachio's and cranberries along with the puffed rice and pour the mixture onto a lined baking tray. I set aside some pistachio's and cranberries to sprinkle on top but that is only really for presentation. Place the tray into the fridge for about 15-20 minutes or until it has completely set. Once it has completely set, break up into shard like pieces and enjoy! I suggest create small shards, these will satisfy a chocolate craving and also because they are very rich so you will only want a small amount.